When members of the Texas Target Communities program with Texas A&M University College of Architecture contacted me about the APA Ambassador program I volunteered to conduct a children’s workshop at their upcoming event to be held in the historic Casino Hall in La Grange, Texas. This recently renovated community facility — which currently houses the cities main street program offices, a small museum, and live theatre venue — was built in 1881 by the Casino Society as a social club founded by a group of German immigrants. The term casino in this context doesn't mean a place for gambling, but rather a gathering place for social endeavors. The City of La Grange has been working with planning students from Texas A&M University to develop a new comprehensive plan for the city. Over the past several months, the group has been exploring topics such as housing, economic development, infrastructure, community facilities, transportation, parks and recreation, and downtown beautification. I wanted the attendees at the children’s workshop to understand the historical context of the city, so I contacted a local engineering firm. The firm provided a map that showed how the city was originally platted near the Colorado River and the historic Camino Real trail route. We also had current maps on display to show what has changed and what has stayed the same. We asked the elementary and high school students to share their thoughts on the path, shelter, and play opportunities they see in their community today. Parents who stopped by shared their thoughts, too. I also used prompts from the James Rojas “City as Play” workshop, which were very helpful. Planning ideas drawn by 15-year-old Katherine Perales, 9th grade. Image courtesy Diana Wilson, AICP. 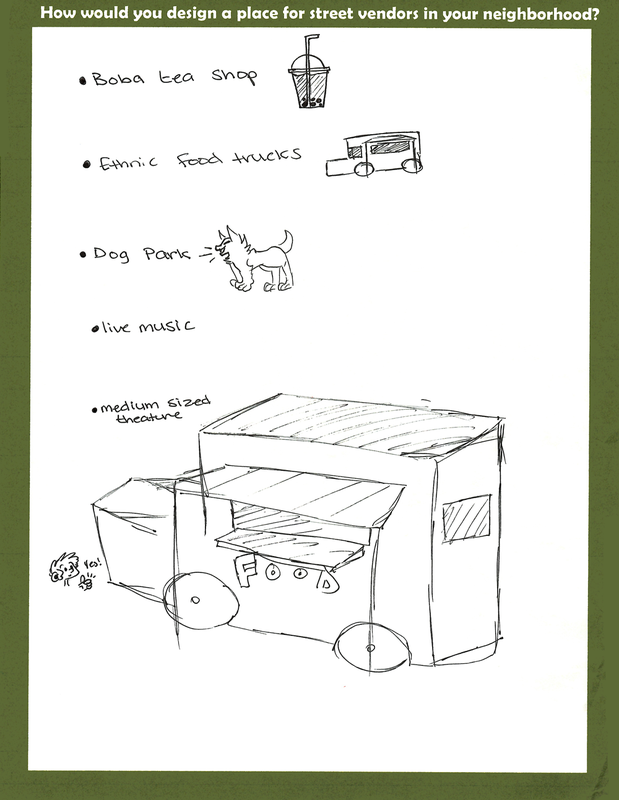 The students drew sketches of food trucks, a movie theater, and even a place to keep their horses. The desire for a kayak launch, bike share program, skate park, and a place for children’s parties were also listed. Many people expressed a desire for a dog park and a live music venue. My student helper, Sarah, and I presented the findings to the 85-person group at the end of the evening. While this activity was designed for the children of community members in attendance, the large group of attendees and student leaders applauded the thoughts and ideas developed in the children’s workshop. Top Image: Youth participants look at maps of La Grange, Texas. Photo courtesy Diana Wilson, AICP. Diana Wilson, AICP, a landscape architect and planner, is director of planning at Burditt Consultants in Conroe, Texas.